System partners ENGEL, ACH-Solution and Dow Silicones will be presenting, for the first time in Europe, an integrated solution for cost-effective production of LED lenses with a highly demanding geometry at Fakuma 2018. 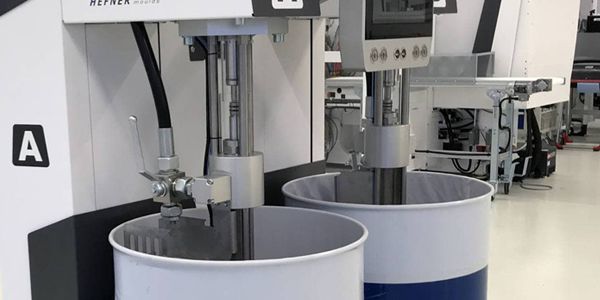 At its stand, lenses for LED headlamps will be produced on a tie-bar-less ENGEL e-victory 310/120 injection moulding machine, with an integrated ENGEL viper 40 linear robot, in a two-cavity cold runner mould by ACH-Solution (Fischlham, Austria). Due to its barrier-free clamping unit, the tie-bar-less e-victory injection moulding machine opens up enormous efficiency potential in liquid silicone rubber processing. One of the reasons for the tie-bar-less e-victory’s accurate reproduction of surface detail is the outstanding parallelism of the mould mounting platens. The patented force divider ensures that the moving platen follows the mould precisely while clamping force is building up and that the force is evenly distributed across the platen face. To guarantee the required precision during injection, the e-victory machine is equipped with an electric injection unit and iQ weight control improves process stability. This intelligent assistance system from ENGEL’s inject 4.0 product programme can detect fluctuations in the ambient conditions and raw material, compensating for them automatically during the shot. ENGEL integrates all the production cell components with the injection moulding machine’s CC300 control unit, therefore the entire process, including the MaxiMix G2 type LSR metering equipment by ACH-Solution, can be set up and controlled in an uncomplicated way. At Fakuma visitors can be guided through the work steps required to start the production cell with AR (Augmented Reality) glasses from AVR Tech Innovations (Fischlham, Austria).